We fly to thy patronage, O holy Mother of God, despise not our petitions in our necessities, but deliver us from all danger, O ever glorious and blessed Virgin.’ The earliest known text of this prayer Sub tuum Praesidium confirms that devotion to the Blessed Virgin Mary and reliance on the efficacy of her prayers were already known before the end of the 3rd century. In A.D. 431 the Council of Ephesus concluded a century of doubt with the declaration that Mary was to be confessed without qualification as Mother of God. Alongside devotion flourished the stories of her life. Their narrow stream within the New Testament itself grew within two hundred years to become a broad and powerful river in the Church’s landscape. A belief in the Virgin’s own Immaculate Conception is already suggested and the story of Christ’s birth in a cave recorded in the Protevangelium of James, c. A.D. 160. Days were designated for the Virgin’s honour and music composed for their celebration. Its repertory extends back to the earliest layers of Western notated music, of the 9th century. Such plainsong melodies, the oldest form of setting, are still heard in some of the pieces recorded here, from Palestrina’s of the 16th century to Dupré’s of our own. From the first period represented in the present programme come the works of Palestrina, Soriano, Eccard, Parsons and Byrd. The first two spent most of their professional lives in Rome, Eccard was a Lutheran German, Parsons and Byrd were Catholic Englishmen. Palestrina’s Alma Redemptoris Mater, setting a sophisticated 11th century poem, illustrates one use of plainsong in the Renaissance: the opening of the chant is heard by itself, its remainder is used in a simplified form as the basis of the soprano part. The second group of composers, from Schubert to Rachmaninov, spans the Romantic era. Schubert set the first two stanzas of the Stabat Mater for voices and orchestra at the age of eighteen. In an original and effective device he sets the words twice, starting off his second section as he had the first, but then varying and developing the material. Bruckner, whose Ave Maria opens the programme, stands virtually at the end of the Viennese tradition to which Schubert belonged, although by writing for unaccompanied voices he allies himself also with the Romantic recovery of Renaissance ideals. It is instructive to compare his short, intense setting with Parsons’: Bruckner’s is harmonically far more complex and is predominantly homophonic whereas the earlier work is contrapuntal. In Bruckner’s we hear the Holy Name (omitted by Parsons) three times in block chords, each louder than the last. Rachmaninov creates a different effect again, with more melodic continuity than Bruckner and great harmonic simplicity: there are no accidentals in the piece from beginning to end. Each of these three settings achieves its devotional effect through highly sensitive though very different uses of vocal texture. Both Widor and his pupil Dupré are represented here by plainchant settings. Widor’s Salve Regina is a product of his later years, when he had become interested in such possibilities, and replaced the original fourth movement of his second Organ Symphony. The Dupré piece is based on a plainsong Office hymn, ‘Hail, Star of the Sea.’ In a recollection of medieval practice Dupré alternates the setting of stanzas between organ and choir. He composes movements for the hymn’s second, fourth and sixth stanzas and for the Amen. Before and between them we hear the plainsong chant of the other four stanzas. The Romantic element was also strong in English music of the first half of the 20th century. Ist most striking exponent was Howells, brought up in the Brahmsian tradition as a pupil of Stanford. 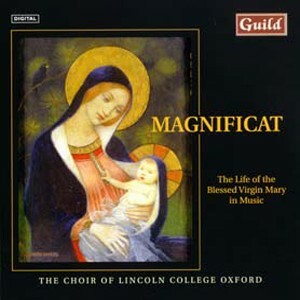 But his most noteworthy contribution to the choral tradition, a series of canticle and other settings dedicated to the choirs of various collegiate and cathedral churches, began only in the 1940s with the present Magnificat and its associated Nunc Dimittis for King’s College, Cambridge. Its warm lyricism has precedents in Stanford and Wood (another of his teachers), but the particular blend of modality and chromaticism is very much Howells’ own. The three short Christmas pieces by Joubert, Tavener and Britten have in common an extreme simplicity. Britten’s Hymn to the Virgin was published in 1935, and has never left the repertory since. Joubert came to England from South Africa in 1946, when he was 19 years old; his most effective contribution to the Anglican choral repertory has been in such straightforward hymns as the carol There is no Rose heard here. Tavener has made simplicity of structure a feature of even his largest compositions; it is not surprising to find it in his smallest. The Hymn to the Mother of God is a chordal canon for two choirs; the Hymn for the Dormition draws its idiom from the melismatic chanting, both melodic and chordal, of the Byzantine and Russian traditions. David Sanger’s Salve Regina is distinctive in style and technique; there is a hint of Messiaen, perhaps, in the combination of extreme chromaticism and a diatonic conclusion, and in the irregular metre of the first section. Arvo Pärt and Henryk Górecki represent the pragmatic element in modern Eastern European music; both have written scores of some complexity but, like our own Peter Maxwell Davies, are able to refine their idiom to a point at which it can embrace a pure diatonicism. Pärt’s Bogoróditse Dyévo, a setting of the Old Church Slavonic ‘Ave Maria’, was composed once more for King’s College, Cambridge. Górecki’s Totus tuus was written for John Paul II’s visit to Warsaw in 1987. Its text alludes to the Pope’s own episcopal coat of arms: a cross beside whose base stands an initial M, with the motto ‘Totus tuus.’ The long drawn out intensity of Górecki’s piece is a very modern expression of that deep personal devotion felt by many saints of every age to the Virgin Mother of God.